My Grandma Edie was the original pie baker in our family. She owned a small cafe in Whittier, California, briefly in the 40's. The story goes that people came from all over to have her homemade pie. I remember from a young age eating her pies and cinnamon rolls and many many other yummy treats. As long as I can remember, my mother (her daughter) baked apple pies. I remember snatching a piece of dough while she was rolling it out. My grandmother moved to Yucaipa in the 60's and once when my mother was visiting her, they toured Oak Glen and my mother brought home an apple pie. I wouldn't touch it. I only wanted mom's or grandma's homemade pies. In my 20's I moved with my young family to Yucaipa. One apple season, I began making apple pies and selling them in Oak Glen at bake sales every weekend which benefited the Old Oak Glen Schoolhouse. I also worked at the bakery at Los Rios Rancho, baking hundreds of apple pies. Those pies were mass-produced and as far as I was concerned, not really that good. Can you tell, I'm just a tad picky about my apple pie? I've had a dream to open a pie shop for years and in the summer of 2015, a couple of years after retiring, there was an amazing crop of delicious local peaches. I began baking peach pies, then berry pies, then strawberry-rhubarb pies and selling them. The business exploded! I created a facebook page and received an incredible amount of support from the community. I'm now baking on Thursdays at the Yucaipa Elk's Lodge kitchen and loving every minute of it! I especially love meeting all my customers and hearing their stories of what pie means in their life, especially the nostalgic memories. I like that they enjoy posting pictures on Facebook of their pies in various states of being eaten! I love my Pie Peeps!! This business started when I found there was an outstanding crop of local peaches in the summer of 2015. I love good peach pie, and when I made one with these delicious peaches, I knew that others would love it too. They did! I spent a lot of time peeling and slicing peaches that summer, but I was and still am convinced that the taste of fresh peaches versus canned or frozen in a flaky pie crust, is just incomparable. Little did I know that in the next two years I would learn to make at least 20 more types of pies! When my business was just getting started, and I began renting the Elk's Lodge kitchen twice a week, I was getting regular orders and someone asked on my facebook page, why don't you make chicken pot pies? Long story short, I'm now making a savory Chicken Pot Pie that is very popular! I'm hoping to be offering other savory pot pies soon! 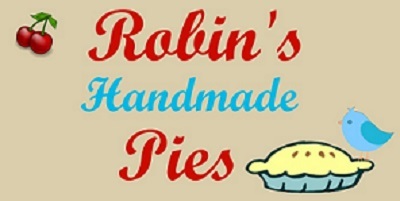 My pies are each made, individually, with fresh, high quality ingredients and no preservatives. I love picking out the fruit and other ingredients myself. My pies are filled to the brim. There is no scrimping on fruit, nuts, and other ingredients. I make a 9" pie, which serves six to eight, and a 5" mini pie, which serves two. The prices vary according to availability,price of ingredients and labor required to make them.